STRUMIS LTD and InfoSight Corp. form strategic partnership to help Fabricators track production. InfoSight manufacture innovative non-destructible bar-code labels & metal tags for tracking Structural Steel Items through-out the entire fabrication process; from stock-control, production, to hostile environments of shot-blasting, painting, galvanising, to final erection. Together with the modern & mobile STRUMIS Bar-code Scanning application, Fabricators can quickly progress, and accurately trace, every item through-out each production stage. Using traditional hand-held scanners, alternatively modern Android, Apple iPhone, or Windows devices to easily scan the InfoSight tags & labels. This significant new functionality will deliver substantial benefits to users of STRUMIS and InfoSight products in terms of real time automation delivered throughout the project. With STRUMIS you can update from anywhere to give you real time project production status without the need of a permanent workstation. Bar-coding with STRUMIS provides the simplest, most user friendly way to track and trace pieces; reducing the paperwork and minimising the time required. STRUMIS assures information accuracy, just swipe to collect data and use the STRUMIS Barcode Data Collection Wizard to easily import all of the barcode data into STRUMIS. InfoSight Corporation is a world leader in identity systems for harsh industrial environments and extreme processes. 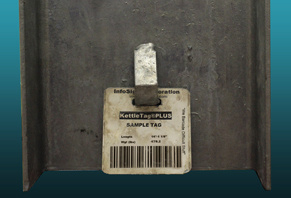 Our specialty is barcode-ready metal tags designed to survive where identity, tracking and traceability cannot fail. For over 30 years, STRUMIS LTD has been developing advanced Steel Fabrication Management Solutions, available in 15 Languages, supported and in-use by over 20,000 Users in 50 Countries. STRUMIS is an all-encompassing steel fabrication management information system that harnesses the information flow and work processes through the steelwork contract between departments, suppliers and clients; from estimate tendering, through procurement and production and onto construction. STRUMIS steel fabrication management software is for engineering and fabrication companies looking to implement a dedicated fabrication management information system to manage across a workshop and all departments including multiple sites, or even across supply chains.